The Chemical Guys Hybrid V7 High Gloss Car Wash Soap will increase shine, while maintaining any protection you have applied (sealants, waxes, and coatings). Hybrid V7 Soap produces thick suds and foam that encapsulate dirt and contamination, while lifting it away from the surface. These super-slick paint cleansers and lubricants allow you to glide your wash media over the surface without any harsh rubbing. This greatly reduces the risk of implementing any swirls, scratches, and other imperfections into your paint! V7 Soap is pH-balanced, and will not spot or stain even when used in direct sunlight. Once finished you will notice that the gloss enhancers in the soap leave behind an incredible amount of shine on a bare surface, and they will enhance the shine of any protection you may already have on your car. For even more shine and protection, follow the V7 Soap up with the Chemical Guys Hybrid V7 High Gloss Spray Sealant. Clean your car while taking your shine to the next level with the Chemical Guys Hybrid V7 High Gloss Car Wash Soap! Hybrid V7 High Gloss Car Wash Soap is a revolutionary detailing shampoo that cleans and enhances shine after every wash. The advanced auto wash take shine to the next level. 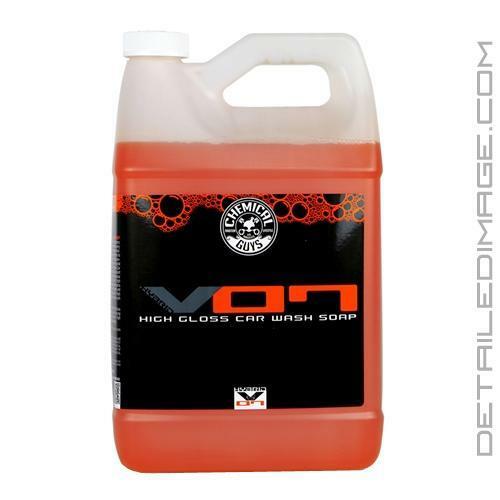 Hybrid V7 High Gloss Car Wash Soap creates thick foam to quickly remove dirt and grime from the surface. The concentrated formula cleans paintwork to preserve the original factory condition of any vehicle. Hybrid V7 High Gloss Car Wash Soap is safe for all paint types and creates a brilliant shine on any color. The high suds formula creates intense foam that rinses clean to wash away dirt. Hybrid V7 High Gloss Car Wash Soap conditions the surface to enhance gloss and restore water beading. Your vehicle will feel smooth and silky with brilliant shine after every wash. Hybrid V7 High Gloss Car Wash Soap is the perfect choice for a clean wash with superior shine. Follow with Hybrid V7 High Gloss Spray Sealant from brilliant shine and protection. I just switched form Griot's Garage Car Wash. It seams like it might have a bit more lubricity. It made more suds. Im happy with it till I find something better. Good foam, not much needed for 5 gallon bucket and just an overall great soap. On my 2nd one. Maybe the pro Meguiars's is a little better, but not considering the pricing between the two.